A Schwinn digital Bicycle speedometer costing less than ten dollars can be converted to a tachometer simply by selecting "miles per hour" and entering the value 2682 for the “wheel factor” (the circumference in millimeters) during the set-up procedure. Actually, most digital bike speedometers can be used as tachometers by entering the same value, 2682. 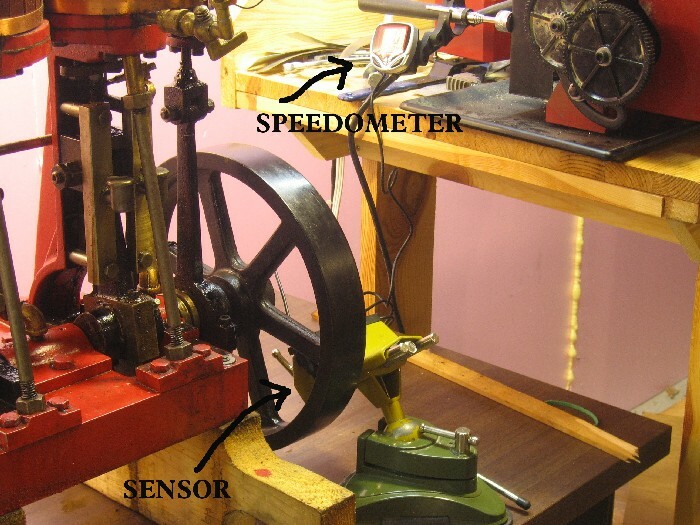 The magnet supplied with the speedometer is a silvery cylindrical fixture meant to be mounted on a spoke. As the wheel revolves, the magnet passes the sensor and the time needed for the revolution is converted to MPH or, in our case RPM. 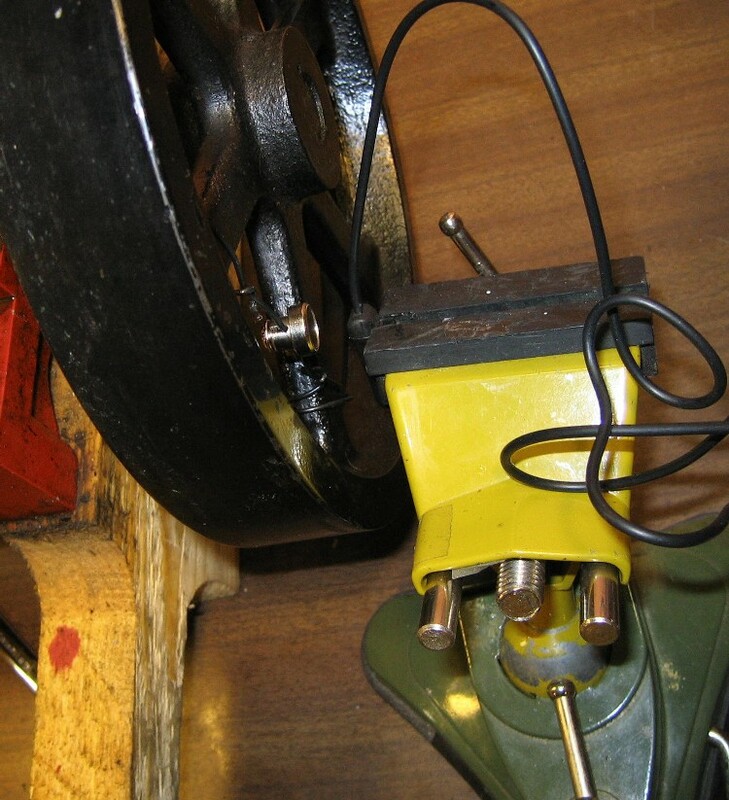 We use a length of stiff wire wrapped around the flywheel's spokes to function the magnet to be mounted. The sensor is a small black plastic device that must be located within about 1/4" of the magnet as it passes by. 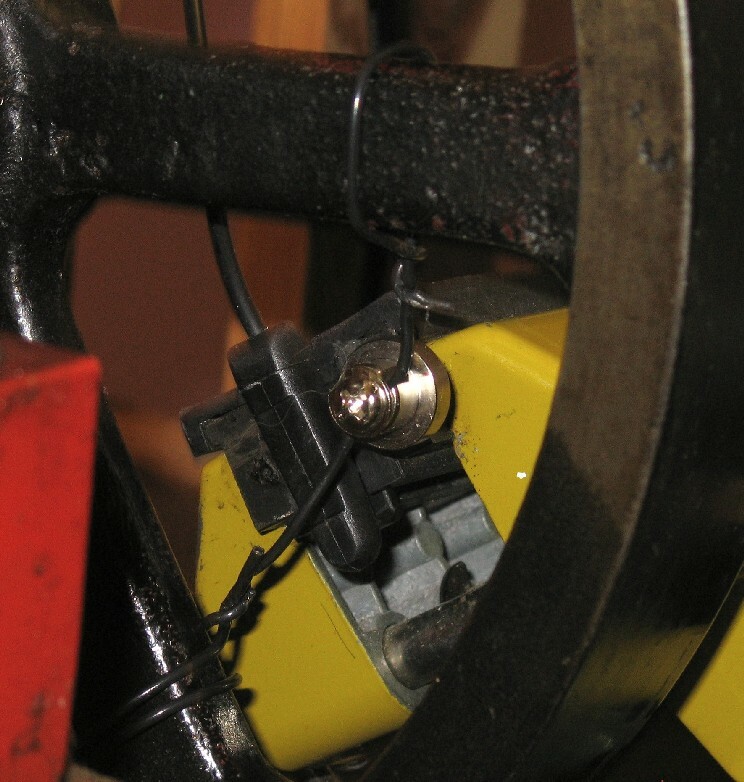 In the photo below the sensor is mounted in the padded jaws of my small yellow modeling vise and the magnet has been fastened to the wire by a Phillips screw. 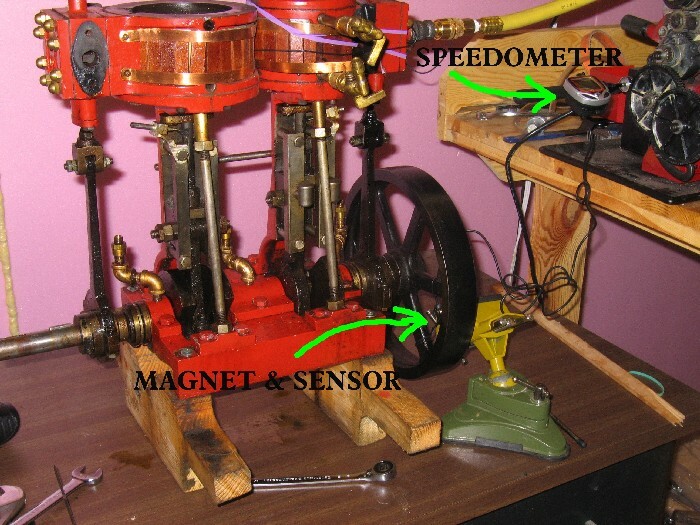 If you can't mount the speedometer magnet to your flywheel, Radio Shack sell a pair of inexpensive rare earth magnets (64-1895) that will simply stick to the flywheel and trigger the sensor. They are strong enough to stay in place during rotation. as you align the moving engine. along with the steam transfer manifold. This reduces air flow in the non-powered cylinder and allows the two cylinders to be adjusted independently. The connecting stay between the two cylinders is also removed. An air line is connected to the steam chest of the functioning cylinder, in this case the HP. 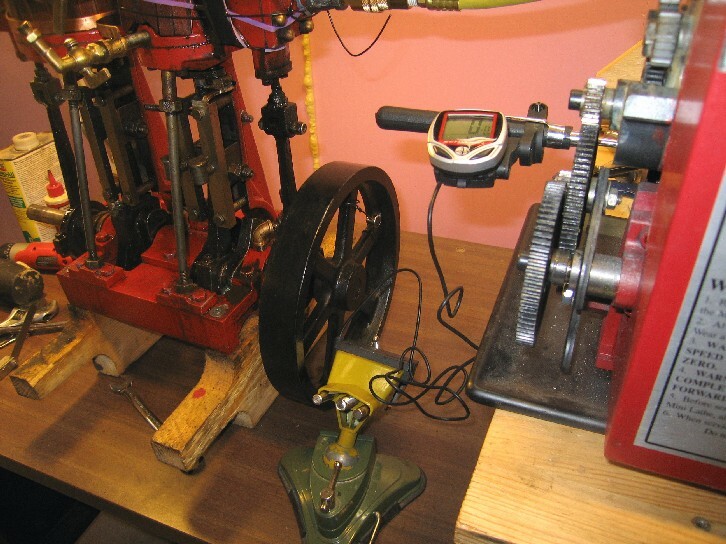 is always rotating at about 200 rpm or less, thus minimizing engine vibration. and allow the functioning cylinder to cool. and the column freed gently from the base with a rubber mallet. watching the rpm meter as you manipulate. You may need to shim the column with feeler gauge leafs to get your best performance. Work slowly! I significantly reduced my frictional losses using this alignment process. Below are a few short movies of the tachometer working. The aligned engine running at 189-190 rpm. Before alignment it ran at 176 rpm.